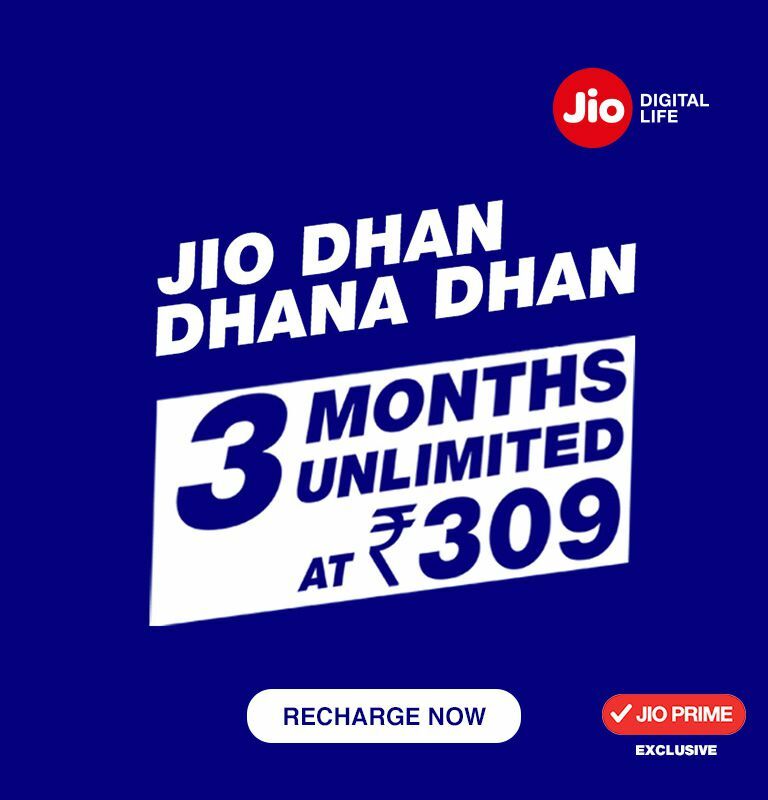 Jio Dhan Dhana Dhan Offer – Reliance Jio Recharge 309, 509 plans and Get 3 Months Free Benefits (unlimited Data, Free Voice, SMS, Apps). 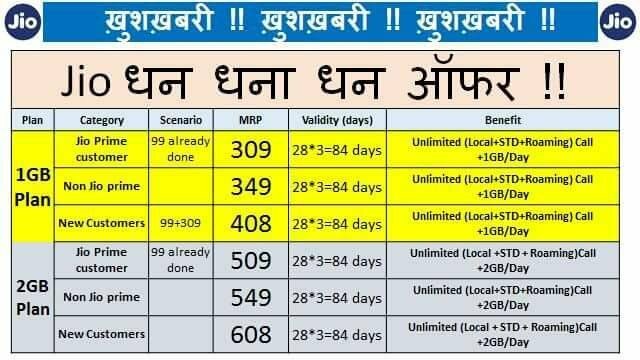 Jio Once Again Back with best offer…replacing Jio Prime summer surprise offer with new 309, 509 new tariff plans. 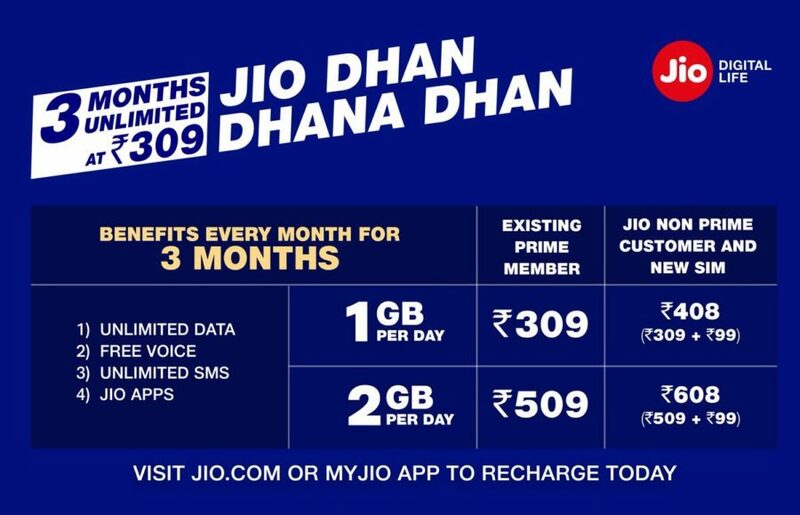 Jio officially announced this Jio Dhan Dhana Dhan Offer as a replacement of Jio Summer Surprise offer by just changing name And Increasing price Rs.6 Extra for jio summer surprise offer. After the announcement of the revision of plans, Jio has come up with the new Dhan dhana dhan offer replacing the summer surprise offer. The younger telecom has stopped the summer surprise offer as per the regulations from the TRAI. The company has announced the Jio Prime membership for its users last month. Note: JIO DHAN DHANA DHAN OFFER is limited to one recharge only and not available along with JIO SUMMER SURPRISE. Reliance Jio, after a directive by Telecom Regulatory Authority of India on April 6, has withdrawn its Summer Surprise offer. However, Jio has revived the deal and named it as De Dhana Dhan offer. However, users can still opt for the Reliance Jio Prime membership offer till April 15 as announced earlier. If a user wants to purchase the Reliance Jio Prime membership, they will have to buy it fro Rs 99 but there is a catch. The new users will also have to recharge with another tariff plan in order to enrol for the Prime membership. Now, according to Jio’s website, the minimum recharge for the first month has come down to Rs 149 from the earlier minimum of Rs 303. Under the new plan, users for the price of Rs 309 and Rs 509 will get 1GB and 2GB of 4G data per day respectively. So, users who has still not signed up for Jio Prime and wish to do so, will have to purchase it at a price of Rs 408 (Rs 99 Jio Prime subscription + Rs. 309 pack) or Rs 608 (Rs. 99 + Rs 509). HOw to Get JIO sim for this offer with number starting with 9? Recharge of RS. 408 new costumer can get a prime membership?